My new shock arrived today, so with little ado, I fitted it. The instructions say that I should end up with the YSS sticker facing outward, However, my sticker faces the wheel. ...... I cant turn it around because the damper adjustment screw fouls the frame and it just looks wrong. I do have it the right way up don't I? I have one of those shocks and the sticker faces outwards without any issue. It is fitted right way up. 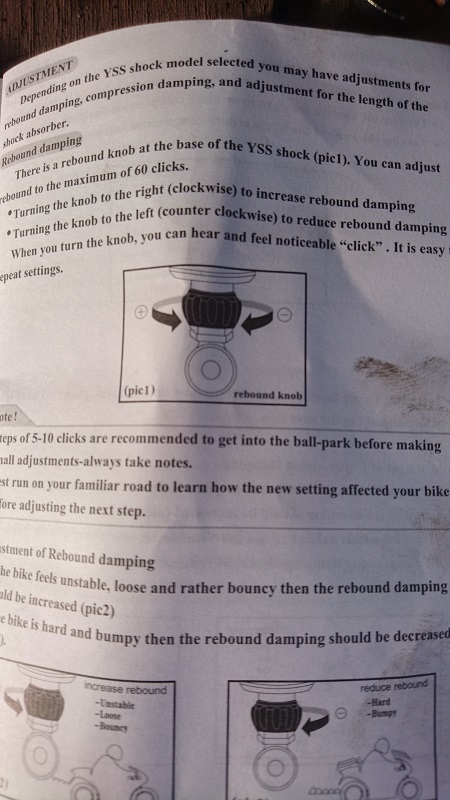 The damper adjustment screw? There is a lock screw on the ring you rotate for the preload, open that and adjust your preload and then lock it when you have the locknut facing outward. That looks like a Y series and you only have the preload adjustment on that one. The other little screw you do not open or you release the gas. The other little screw and the block that it goes into hit the frame if I mount it with the sticker facing outwards. Thats why I wanted to check that I had it up the right way. I will post a pic of the instructions tomorrow. I left the book in the shed. As long as it's the right way up I guess I cant go to far wrong. I am still tempted to grind 2 or 3mm off of the frame lug so that the sticker is around the right way. I also have dampening ajustment by the rubber twist thing on the bottom and the booklet that came with it says that the screw at the top is compression or rebound dampening ajustment, I cant remember which. I will take a pic of the instructions when it warms up a little. You were right Olaf. The adjustment screw is on another model of shock. If I unscrew it, I will just let the gas out. Is that a Michelin Macadam tyre? How old is it? @MarcS wrote: The other little screw and the block that it goes into hit the frame if I mount it with the sticker facing outwards. Thats why I wanted to check that I had it up the right way. I will post a pic of the instructions tomorrow. I left the book in the shed. The rubber ring at the bottom of the shock is the rebound damping. The shock is the right way around. Olaf, your shock is the same as MarcS, so you have rebound damping at the end as well. 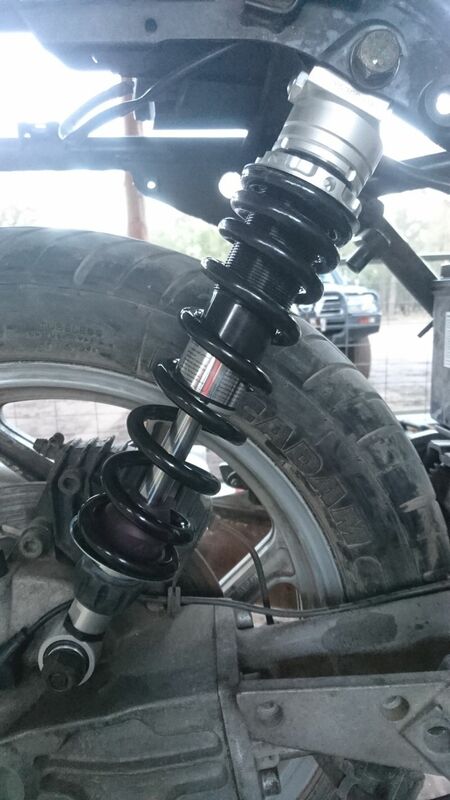 Marc i'm considering getting the YSS to replace my 15yr WP rear shock on my K100RT (1985). @RicK G wrote: Get the WP rebuilt. Hmm.. Haven't thought of this option Rick. You think it's worth ? Worth every bit, you'll end up with a far better shock than a YSS or a Hagon. Hagon are a very harsh ride. Before I replaced the shock on the K100RT I looked at a few options. Rebuild the BMW one which was a no no, rebuild a Koni which I have [locally quoted more than a YSS Z series], found a used Hagon but the seller wanted too much [more than the price of a new YSS], buy a used BMW one [but they all fail]. Been quite happy with YSS and I have both Y and Z types. Thank you gentlemen for your answers/suggestions. Current shock ( WhitePower ) replaced the original one at 96000km by the previous owner. Bike reached 101000 until 2006 if i recall and from that time was put on the center stand until half a year ago that i bought it from my buddy. After putting more than 1000km myself on the bike the past few months i noticed bottoming of the rear especially when riding double. The heavier the passenger the easier it bottoms. I have set it to 2/3 of the preload and middle dumpening value. Its rather harsh when riding alone but great in higher speed curved roads. Very positive and stiff feeling of the rear. So i thought that a replacement is needed. Cant reach the Wilberts nor Ohlins shocks due to high pricing. So i m looking for an alternative. YSS have great price point and Hagon follows. But as Rick suggested the rebuilt option , i rang a call to the WP rep and said that he could service it starting from 80 Euros and if he needs to change spring ( which he doubts ) will cost an additional 80-100 euros. For 200 euros i can get the adjustable YSS new one and for 40-50 more the Hagon. Rebuild the WP it will be the best move. WP is every bit as good as Ohlins if not better. I had a WP on my K100 and it was a bit harsh on the bigger bumps but considering it was meant for track work I accepted that but the WP that is made for road work is the best you can buy. I can understand that you may prefer a better known brand but think of it like this , would you have an Ohlins in preference to the YSS or a Hagon which are both middle of the road shocks, I know what I would have. I was thinking though, for 2 up would you not need full preload and not 2/3? 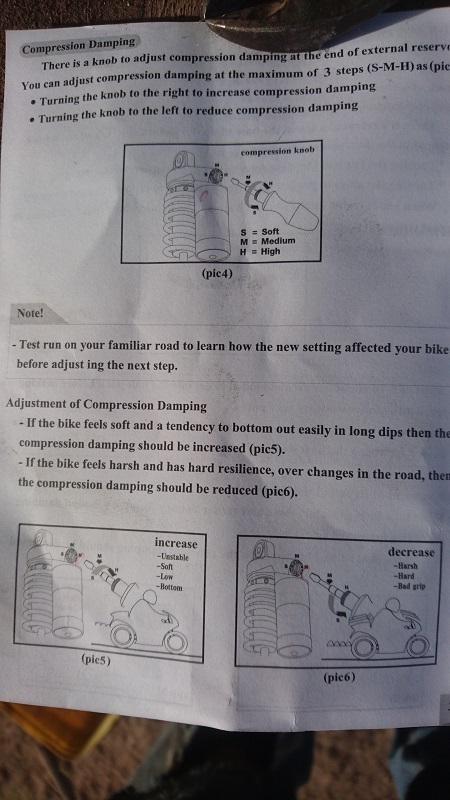 Also more damping? Why would you need to rebuild a top of the line street shock with only 6000km on it? If anything, you might need a higher spring rate to prevent bottoming when two-up. Harshness could be a function of the shock bottoming out on bumps due to a low spring rate or possibly too much compression dampening. Is the shock gas charged? You might just need it recharged to the correct pressure. Spend some time setting up the pre-load for the correct sag(approximately 3.5cm) when you are sitting on the bike and then getting the dampening dialed in. Personally, I would start the tuning process with minimum dampening both compression and rebound, and slowly increase the rebound to minimize rear end bounce. I don't use much, if any, compression dampening in order to get a smoother ride on the often terrible roads I ride on. @George_Pap wrote: Marc i'm considering getting the YSS to replace my 15yr WP rear shock on my K100RT (1985).